8. If he prefers modesty in the ways of God, than pride and arrogance before the Gods enemy. 9. If he prefers anonymity than renown and population. Salaams on you, O dearest Imam! On 11th of Dhu Al Qa’dah, 148 Hijrah, a son was born in the house of Imam Musa Ibn-e-Jaffar (A.S.) who took over the position of the Imam of Islam, after his father. He was named Ali and titled Ridha. The honorable and gracious mother of the Imam (A.S.) was Najmah, who was considered to be the most notable and distinguished lady in the realm of wisdom and faith. Some examples of the Imam’s vast knowledge and intellect are narrated when Mamoon invited scholars from different schools of thought to attend a debate over theological issues of the doctrine of faith. Mamoon, who was the caliphate at that time asked the Imam (AS) to take charge of the affairs of the Muslim government to which the Imam refused, because Mamoon’s government policies were contrary to the principles of Islam and the teachings of the Holy Prophet (SAW). Thereafter Mamoon asked the Imam (AS) to be his successor. Imam reluctantly agreed with the condition that he will not be asked to take part in any government tasks or policies during the lifetime of Mamoon. The best gift we could give to our Holy imam (AS) is to try to emulate his conduct and improve our Akhlaq, as our dearest Imam has shown exemplary character, generosity and tolerance. The Imam (AS) has said that Allah (SWT) increases the dignity of those who forgive others. On this auspicious and divine occasion we extend our Heartiest and Happy Greetings. 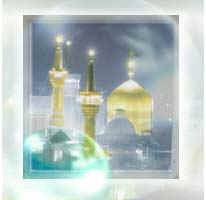 Imam Ali ibn Musa al-Reza (A.S.), the eighth Holy Imam was born on 11th Zee al-Qa’adah 148 A.H. in the holy city of Madinah. He was divinely entitled ‘Al-Reza”(meaning – Allah Almighty and His Holy Messenger (S.A.W.W.) were deeply pleased with him). The Holy Imam (A.S.) is also considered as the Aalim (the Greatest Erudite) of the Holy Ahlul Bayt (A.S.). Holy Imam was poisoned by Mamun, the Abbasid caliph in Sanabad in Toos region (Khurasan). The Holy Imam (A.S.) attained martyrdom on the last day of the month of Safar 203 A.H./ 818 A.D. and was buried in Sanabad. After the burial of Imam Reza (A.S.) in this place,Sanabad soon transformed into a metropolis, later known as Toos and then Mashad. His period of Imamat was around 20 years. The holy shrine of Imam Reza (A.S.) in the holy city of Mashad is also one of the most extensively visited pilgrimage centre in the world and annually more than 20 million pilgrims and lovers of Holy Ahlul Bayt (A.S.) from all parts of the world visit the holy shrine of Imam Reza (A.S.). On the Happy and Auspicious Occasion of the Birthday Anniversary of Imam Reza (A.S.) we extend our Heartiest Felicitations and Happy Greetings to all the lovers of the Holy Ahlul Bayt(A.S.) in the world. His grandfather Imam Ja’afar Al-sadiq (A.S.) died one month before the birth of Imam Reza (AS). The family must have been consoled by his birth which took place after such a great loss. He was brought up and instructed by his affectionate father under whose supervision he passed his boyhood and youth. He availed himself of the instructions of his learned father for thirty one years till the later was taken to Baghdad to suffer the hardship of imprisonment for four years till his death. Imam Musa Ibn Ja’afar (AS) could foresee that the hostile Abbasid ruler would not allow him to live peacefully and circumstances would take such a turn that his followers would not be able to see him or enquire about his successor prior to his death. So while free and undisturbed in Madina he felt the need to introduce his successor to his followers. He, therefore, assembled seventeen prominent dignitaries from the descendants of Imam Ali (AS) and proclaimed that his son Ali Ibn Musa (AS) would succeed him. He also wrote his will on which 60 respected elders of Madina signed as witnesses. Such elaborated arrangements were never made by any other Imam and they proved to be most appropriate due to the controversy about the Imamat which ensued after the death of Imam Musa Ibn Ja’afar (AS). Imam Reza (AS) was 35 years old when his father died in prison of Harun al-Rashid in Baghdad and the responsibilities of the Imamat devolved on him. At that time Harun Al-Rashid was the absolute ruler of Baghdad and the descendants of Imam Ali (AS) were passing as ever, through trials and tribulations because of the tyranny of the Abbasid ruler. Yet Imam Reza (AS) carried on the responsibility of administering the Divine Law of Shari’ah as taught by the Holy Prophet and Imams of the Ahlulbayt after him. After putting an end to the life of Imam Musa Ibn Jaa’far (AS) Harun al-Rashid lived for ten years. He had less tolerance for the existence of Imam Ali Reza (AS), and then he did for his revered father. But he also knew that his Government had already lost face due to its prolonged maltreatment and eventual assassination of Imam Musa Ibn Ja’afar (AS) or perhaps the tyrant felt the stings of conscience which kept him from harassing the 8th Imam. Still, Harun was antagonistic towards the Prophet’s descendants and persisted in maltreatment of most of them in Madina. The local Governors of Madina who wished to please the ruler could not afford to be fair to Ahlulbayt. People could not visit the Imam freely seek his knowledge, and he had little chance to teach his followers openly, for the eyes of the agents of Caliph focused unceasingly on the activities of the Imam. Political wrangling in Baghdad between the two sons of Harun was rocking the Empire. His elder son Amin who had an Arab mother had the support of the Arabs and most of the Abbasid elders, while the younger son Mamun had a Persian mother and was supported by the Persians. To console both factions Harun took a pledge from both his sons that after his death Amin will rule the Arab part of the Empire while Mamun will rule the Persian side. When Harun died in far away Toos, the most northern town of his Persian Empire, Mamun was with him and buried him there. Amin in Baghdad immediately proclaimed himself the Caliph of the whole empire and immediately deposed Mamun from the rulership of the Persian Province. Mamun’s main concern was to subdue the Persian province under any circumstances. He realized that the majority of Persians favoured the teachings of Ahlulbayt and if somehow he could persuade the Imam of the Ahlulbayt in Madina to side with him, he could confirm his rule there. Once he felt secure on that side of the Empire, he would then rise against his brother and easily depose him. So the orders were sent out for the Imam to leave his home in Madina and go to the Abbasid ruler in far away Toos. Imam, as if by some miracle knew what was to come. So he left his wife and only son Muhammad Ibn Ali al Jawad, later known as Imam Muhammad Taqi (AS) in Madina. He also called many elders of Madina mostly from Banu Hashim and told them of his call to go to the outpost of the Empire to see Mamun. The date of his departure was in the month of Rajab 200 Hijra. It was a long journey to Merve and the Imam set out on this momentous journey with some of his friends who were loyal to him throughout his life. His journey began from Madina to Makka where he performed the Umra, and then he took almost the same route as Imam Hussain (AS) took in 61 Hijra towards Karbala. Half way through the hills of Hejaz when he crossed over to the desert of Najd his route changed to that of Imam Hussain (AS) and his caravan moved towards the eastern side and reached the town of Basra in the month of Shawwal. From Basra he crossed over the Shatt-al-Arab and reached the Persian soil heading towards the town of Qum. It was in the month of Zilhijja that he reached Qum where he stayed for a while. The month of Muharram, the 8th Imam spent in Qum where it is said that he established for the first time a Majlis to commemorate the martyrdom of Imam Hussain (AS). This was the first Muharram in 201 Hijra that set the tradition of Majlis, beginning in Persia the way the Imams of Ahlulbayt had wanted it and the way it was observed in Madina and Makka and throughout the province of Hejaz and Najd and to some extent in Iraq where people thronged for pilgrimage to the Shrine of Imam Hussain (AS). After spending the Month of Muharram in Qum the Imam proceeded towards the northern part of Persia crossing the Al-Burz Mountains to the town of Merv where Mamun had settled with his army to secure his empire for him. i do not know is it in the heavens, is it on the earth, is it in the sea, is it in the land, is it that which is dry, in whose hands is it? and the alleyways and the shortcuts and alleyways is with you, and the ease that which i can reach it is with you. O Allah make it easy for me to find the rizq, make it come to me in a way that i do not have to work too hard. while I am in full need for Your mercy. and confer liberally upon me, Your slave, out of Your graciousness. You are surely the Lord of great favor. When Hajje Ifrad becomes wajib on a lady, it implies that she will not perform Hajje Tamatto. Instead, she will wear the ehram at the Meeqat, reach Mecca and remaining in the same ehram will proceed to Arafat and perform all the rules that a person performing Hajje Tamatto performs. Only her intention will be to perform Hajje Ifrad. She does not have to slaughter an animal on the 10th of Zilhajah. She will, after stoning the biggest pillar (Jamaratul Ula) do taqseer while other Hujjaj wait for the slaughtering to be completed before doing Taqseer. After completing Hajj, she will perform an Umrah. *** Aga Khui and Aga Seestani say she has a choice. Either she can change the niyyat and perform Hajje Ifrad, or she can choose to remain on the intention of Ummrah e Tamatto, and skip the Tawaf and its salat; perform the saee and taqseer and thus perform the Umrahe Tamatoo. Then, wearing the ehram of Hajje Tamatto, proceed to Arafah and complete the Hajj. When it is time to perform the Tawaf, she should first perform the (skipped) Tawaf of Umrah-e-tamatto and its salat, followed by the tawaf of Hajj e tamatto and its salaat. When one enters Mecca in the state of ehram it is not wajib to perform the remaining acts immediately. However, a lady who fears the imminent onset of menses and fears that once it starts she will not become taher as so to complete the Umrah, have to perform Tawaf and its Salat as soon as they enter Meeca. It is forbidden to even enter Masjidul Haram (the Masjid around the Kaba) and Masjidun Nabawi, let alone to be inside. However it is allowed to go to or sit at Safa or Marwa or the path between these two; on the condition that she does not reach Safa/Marwa by going through Masjidul Haram. Instead she should go from outside. Thus when a lady has to perform saee during menses she should avoid going through Majidul Haram. Instead she should reach Safa using the doors which lead directly to the safa-marwa area to perform saee. 1) If the lady begins her Haydh before wearing the ehram of Umra e tamatto, she should wear the ehram with the intention of Mafizzimma (umra e tamatto or Haj e ifrad – whatever be my responsibility.) After reaching Mecca, she should wait to become clear of the menses. 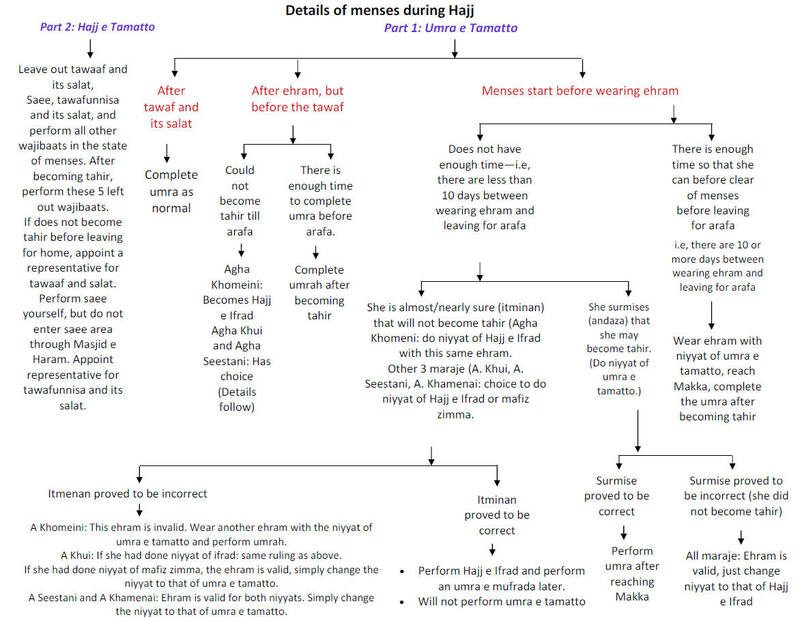 i) If her Haydh clears before she leaves for Arafat, she should perform the Umra e tamatto. Thereafter perform Haj e tamatto as usual. Before she leaves for Arafat means before her caravan leaves for Arafat. If it happens that she becomes clean so late, that now there is no time left to do Umra e tamatto, she can leave with her caravan but then she will perform haj e ifrad, as will be explained later. 2)( i) If she gets Haydh after wearing the ehram of Umra e tamatto, but before she could complete tawaf and its salat she should wait and perform the umra e tamato after she becomes free from Haydh, and thereafter perform haj e tamatto as usual. ii) If she gets haydh after she has finised the tawaf and salat of umra e tamatto, but before saee, she should perform the saee & taqseer in the state of haydh. Thereafter perform haj e tamatto as usual. iii) If she gets haydh after tawaf but before namaz she should wait till she becomes clean and then perform just the salat followed by saee and taqseer. If she does not clear the haydh before she leaves for Arafat, apparently she has a choice to perform haj e tamatto or haj e ifrad as will be explained later. 3) If a lady gets haydh after wearing ehram of Umra e tamatto, but she does not become clean before she has to leave for Arafat, then she has a choice to perform haj e Tamatto or haj e Ifrad. i) If she chooses to peform Haj e tamatto she should perform the saee and taqseer of umara e tamatto, wear ehram of haj e tamatto & leave for Arafat. After taqseer of haj e tamatto when she returns to Mecca for perming the tawaf etc of haj e tamatto, she will first perform the tawaf and salat of tawaf of Umra e tamatto, then perform the tawaf etc of haj e tamatto. ii) If she chooses to perform the haj e ifrad she will convert the ehram of umra e tamatto into that of haj e ifrad simply by making the intention as mentioned in 1(ii).After completing haj e ifrad she will be required to perform an umra e mufradah, which is not wajib e fauri(an immediate obligation). Thus if she cannot perfom it now she should perform it any time in the future. 4) If a lady gets haydh during the tawaf she should, after becoming clean perform just 1 tawaf(7 rounds) with the intention of mafizzimma (completing the old tawaf or performing a new one – whatever be my responsibility). If she was required to complete the old tawaf it will be completed from this tawaf, and the remaining rounds are extra. If she was required to perform a new tawaf, she has done so. 5) If a lady starts haydh after tawaf but before or during salat of tawaf, she should, after becoming clean, recite only the namaz. 6) If a lady doubts whether her haydh started before tawaf/salat or after tawaf /salat or she feels but is not sure when it started she can consider her tawaf/salat to be valid. 8) If it so happens that her haydh does not start on her return to mecca, the tawaf/salat she had performed in advance are still valid. It is ehtiyate mustahab to repeat the tawaf/salat, then do the saee etc. 10) For hajj e ifrad one has to perform the Tawaf, salat of tawaf, saee, , tawafun nisa, & namaz of tawafun nisa . Sacrifce is not obligatory. Taqseer has been done at Mina.